LA PLATA COUNTY, Colo. (CNN) — Massive wildfires in Colorado and New Mexico have torched thousands of acres and forced hundreds to evacuate their homes. 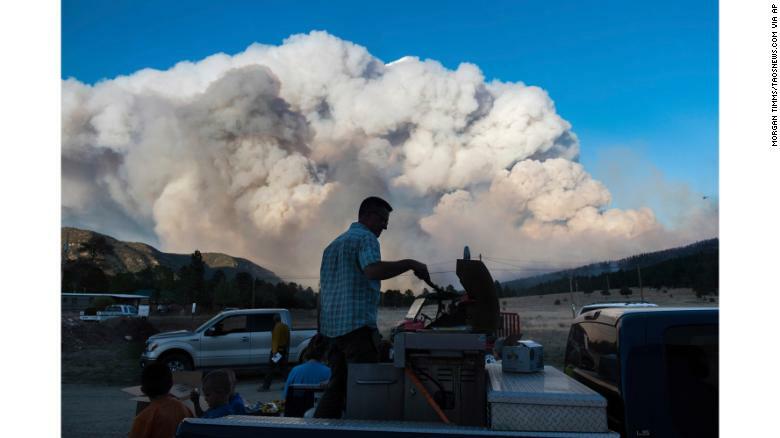 A blaze known as the 416 Fire in Colorado’s La Plata County has burned 1,100 acres, US Forest Service spokesman Jim Mackensen told CNN on Saturday. By Friday evening, the blaze had prompted La Plata County Manager Joanne Spina to declare a state of local disaster. On Saturday morning, grass, brush and timber continued to fuel the fire. And a massive fire in Colfax County, New Mexico, had grown to 27,290 acres by Saturday morning and was 0% contained, according to InciWeb, a US government-operated multiagency fire response site. Nearly 450 personnel were battling that fire. A mandatory evacuation order was in place for the town of Cimarron, where 296 structures were threatened by the blaze, called the Ute Park Fire, according to an update on InciWeb. So far, about 14 outbuildings have been destroyed at the Philmont Scout Ranch, according to the US Forest Service. The ranch, which belongs to the Boy Scouts of America, had already been evacuated by the time the fire closed in on it. Forest Service spokeswoman Judith Dyess told CNN on Saturday morning that the fire was roughly 3 miles from Cimarron and burning in that direction. High winds, which could exacerbate the blaze, are forecast for Saturday, she said.